Last month I wrote an article entitled “Building A Medial Simulation Program Website“, which explained the benefits of building a website for your simulation program and how to get your pages started. In this article, we will touch on how to add the visual stimulus of multimedia and social platform integrations can provide further benefits to your program’s website! Having just recently completed the two-year INACSL website redevelopment project I have some new multimedia secrets to share! Specifically in this article we will cover photography, digital images, videography, social media integration like facebook & linkedin, as well as embedding a Google calendar. As they say, “a picture is worth a thousand words”. While you can type out all the specifications of your simulation program and the number of learners that come through your doors each day and what they are doing there, nothing will capture that “ah-hah” moment of seeing the space through photography. Check with your institution’s media department to learn if a professional photographer is available to help take some photographs of your simulation program. Be sure to schedule the photographer with enough time to capture spaces with and without learners actively engaging in the space. Depending on who will be viewing these photos, you will want to be sure to have the option of showing them the space with or without partcipants in the room. 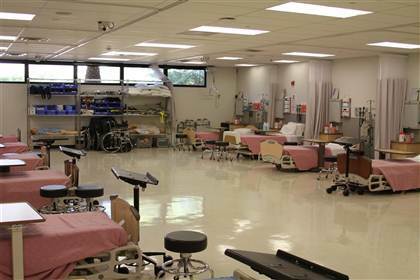 For example, when trying to promote the Clinical Simulation Center of Las Vegas as a set for big budget film productions, the “shooting location scouts” are much more interested in how the room itself looks, not in what your learners accomplish there. (Read my previous article “How to Bring Record Breaking Profits To Your Sim Lab” to learn more about these types of film productions). However, for demonstrating to the community how your program trains healthcare professionals within a modern day technology based facility, clearly it will be important to show how your learners utilize the specialized equipment and the space. For example, here is a photo from Edgar Nunez from the University Of Nevada School of Medicine, a partner at the Clinical Simulation Center of Las Vegas, which is used on the CSCLV website. With a bit of text explaining what is happening in the photo, website visitors are immidiately cued in to what hey are looking at. If you are unable to have institutional media services support, try looking online for a high school or college student photographer through craigslist who would be willing to show up and “shoot the space” for their portfolio. New photographers may be willing to provide such reduced-fee services in exchange for the opportunity to better learn their craft. Just make sure that they sign an agreement that the photos can not be sold without permission. If you still cannot find someone who will work for a reduced rate in exchange for experience, look up local wedding photographer services. While it may cost to have a professional photographer show up, the quality of the photos will help to convey the goals of your required images. It holds true here that “you get what you pay for”, and hiring a professional with a quality portfolio is always the best course of action. Consider that amateur photography may in fact steer people away from your program as shakey, blurry, or over-satured photos can lead to confusion and frustration. If you do plan on taking photographs yourself, be sure to light the scene properly and turn OFF the flash, as well as use a tripod in-order to get steady, focused shots. Photos bring color, life, context and personality to your simulation program. Consider using photos to capture images of your simulation lab spaces, special pieces of equipment, staff headshots, learners in action, educators in action, building exteriors (to better help visitors find the place), award ceremonies, training sessions and other special events. Adding a photograph to a news blog post about your program demonstrates to your audience continued success over long periods of time. But remember, even though photos can be worth a thousand words, even a tagline can help explain to the viewer what is happening in the space. Think about all the potential demographics of the audiences who will be visiting your website and how they will feel about their experience as they land and then visit your pages. A balance of imagery and text helps to tell your story the way it is intended to be told! Beyond photography, you can also develop other digital images to help tell the story of your simulation program. Take for example, the flyer we created for HealthySimAdmin website using Adobe Illustrator. With a bold title, colorful layout, clear bullet points and a special tagline – the message of the opportunity here is quite clear. 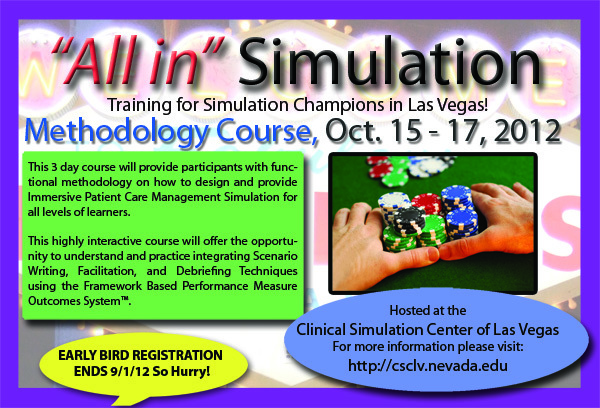 The simulation staff of the Clinical Simulation Center of Las Vegas used Adobe Photoshop to build similar flyers for their ongoing quarterly educator training programs. Notice how the colors ‘pop’ in-order to grab attention. We used this image on the website and printed the image on 4″x6″ cards to hand out to visitors at the center. Consider that your photography can be added into a fashioned digital image to create powerful messages that capture attention and direct it to your actionable links or other program goals. At the CSCLV, they used a photo of the infamous “Vegas Sign” in the background to help connotate where the training was taking place. Note that Adobe programs can be quite costly, and while you can use Photoshop Express online for free, you may want to look into bringing in professionals to help you develop this content (read above on where to find these individuals) as learning how to use these programs can take a great deal of time. Most universities also have an on-campus printshop who may also do project development work beyond just printing. However, if you already have access to these programs, heres a great online introduction to photoshop and one for illustrator. If you are looking for books with stronger support, however, I suggest this one for Photoshop and this one for Illustrator. Use digital images to cover everything from campus maps and directions, center and host institutional logos, and even how-to guides for sim lab center staff (like this step-by-step operational guide for the Laerdal SimMan 3G built by Kaiser Permanente staff). While this short did take about a week to script, shoot and edit, it has since been viewed over 19,000 times by potential students and the Los Angeles community. Just for fun, let’s do the math on how much money this production saved the school. I worked for about $20/hr back in 2009, and would say this video took about 25 hours to produce from start to finish – so about $500. I also had to rent some production equipment, (a camera and borrow my friend’s editing computer), for about another $500 – putting our total cost at around $1000. The best part about the video is that it is hosted for free on youtube.com, which means it can be watched thousands of times without any additional work on our part. So now consider the following: If I had to provide the same 5-minute demonstration in person that would take 5 minutes x 19,253 views which is 96,265 minutes, which is about 1604 hours, or over 200 8-hour work days! At $20 an hour I would have been compensated over $32,000.oo for 19,253 promotional tours! Without a doubt, producing educational content, whether it’s promotional demonstrations or orientations saves time and money. Lets take a look at orientation videos and training videos. Because producing videos is so specialized, I have created a 2-part video tutorial on “How to Create Healthcare Simulation Lab Video orientations“, including where to find free help! Read that guide to learn how to create video specific media content for your website. 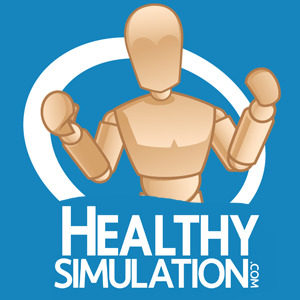 Subscribe to HealthySimulation.com’s free monthly newsletter to get all the best articles! Clearly we need to immediately consider building a facebook business page and/or Linkedin company profile page that can connect the global simulation community to your space. Followers can be contacted on a regular basis to be made aware of exciting news and/or upcoming training events. This presence can be used to demonstrate community engagement to higher levels of administration, and is especially helpful for ongoing marketing purposes. Not only is social media for external relationships, but also for internal ones as well. For example, the Maricopa Nursing Program at Mesa Community College uses social media to better connect with students throughout their educational career. 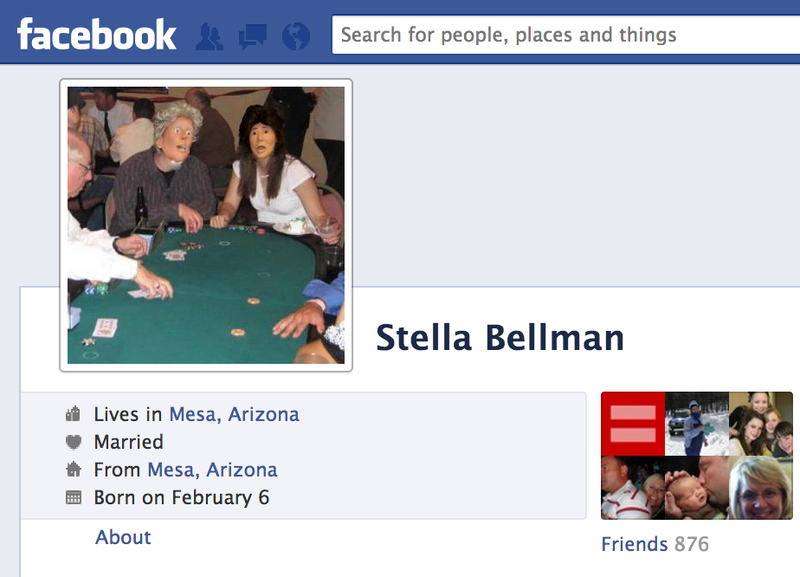 The clinical faculty there created a facebook profile for the center’s leading lady manikin Stella, who encourages students and provides studying advice. While managaging this account takes additional effort for the staff, the response from students has been overwhelmingly positive and has lead to higher performances. With Google’s free online tools, you can create documents, spreadsheets, presentations, file databases, calendars and more in just moments! After creating a free google account you can utilize their free list of web 2.0 Google Products, which can be embedded on your website. 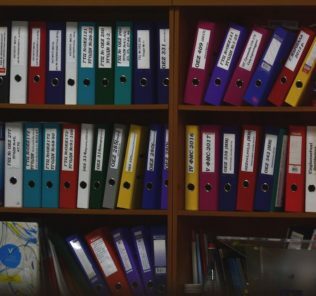 For example, a simulation program can use the free online calendar system to show what rooms are being used by staff and then embed that calendar on the center’s website so that it can easily be found by educators, learners and staff. Watch this embedded google presentation below to see how its done! By adding multimedia to your healthcare simulation website your program can not just tell a story but show it! While this content takes hours to produce with quality, the benefits continue to last for years. If you need additional help building a website I do provide project consulting services, having developed multiple websites ranging from INACSL.Org to HealthySimulation.com, as well as SimGHOSTS.Org, HealthySimAdmin.com, the Clinical Simulation Center of Las Vegas website, and many more. Email me and let me know how I can help! Speaking of the Clinical Simulation Center of Las Vegas website, I suggest you go there to see more examples of how to integrate multimedia into a simulation center based website! And remember, when you build your program website, make sure to add HealthySimulation.com as a link in your resource section (click to learn how) and help pay-it-forward to other simulation programs! EMSIMCases Provides Free Emergency Medicine Simulation Scenarios, Templates and More!